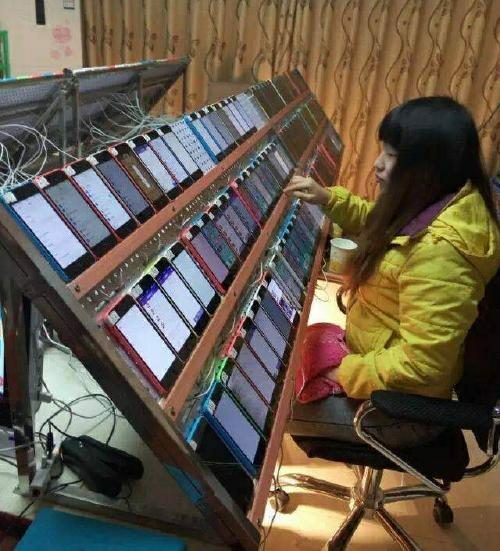 Rumor: Photograph shows a Chinese worker seated at a rack of cell phones, manipulating App Store rankings. Claim: Photograph shows a Chinese worker seated at a rack of cell phones, manipulating App Store rankings. 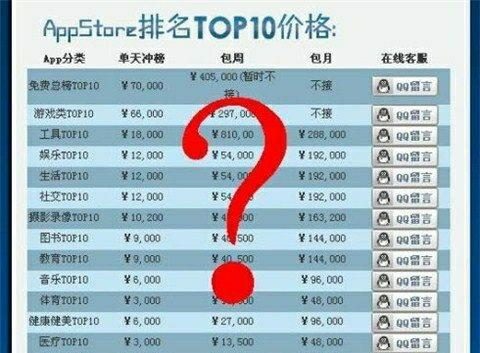 Check out this photo that shows how Chinese workers are used to manipulate App Store rankings. Apple may have killed AppGratis for being too good at driving installs, but the “boost effect” of big marketing campaigns, in-app promotions in popular apps, and other somewhat less savory means of driving big download numbers is still very much alive and kicking. To get top 10 in the U.S., you need 80,000 downloads, mostly in the previous 24 hours. Once you’re there, of course, Apple’s own “app discovery” effect kicks in as users see you featured on the front page of the app store … and you tend to stay there. Mobile app marketing company TradeMob — the largest app marketing platform in the world — says it works with 80 different app discovery partners. Most of them say that AppGratis just became too big for its britches (or Apple’s) and was culled simply for that reason. And most of them are still providing free or discounted apps, with 60 percent of them feeling “perfectly safe” that their app will not be deleted. So based on 72 “boost” campaigns, TradeMob calculated the number of downloads required to hit the top 10 lists for some of the key iPhone markets … and the cost required to make that happen. It turns out that those 80,000 downloads cost you $96,000 in the U.S. for a non-game app — an average price of $1.20 per download. That’s actually cheaper than it would be if you had to buy them all, due to “organic uplift” that helps you generate more downloads as people start using your app, and tweeting, sharing, and talking about your app. The App Store’s ‘Top Apps’ lists are well known to the smartphone-savvy public, but how apps make it into those lists is perhaps less understood. The exposé, shown in the picture, displays a ‘Top App list worker’ in their work place, which features a simple shelf containing hundreds of iPhone 5Cs. In a room filled with such workstations from one side to the other, mobile phone labour takes place at an industrial level. Simply put, a worker downloads (and deletes and downloads, etc.) an app to boost its rank on the App Store, calculated by how many times the app has been downloaded. One worker can operate as up to 100 unique users. Apple has previously adopted measures to deter crank-boosting in order to ensure fair rankings for developers and users. In 2014 November, Apple introduced a 1 yuan strategy to drop the threshold for users to download apps, also intended to negatively impact the crank-boosting industry. But as crank-boosting simulates genuine user activity, it is nearly impossible to detect or safeguard against. Users accustomed to comparing and contrasting apps before download may be unknowingly swayed by crank-boosted apps that have purchased their celebrity. Such sneaky, industrious operations are tricky to break. Accompany[ing] the photo on some sites is an alleged price list for boosting your app ranking. Getting into the top 10 free apps costs RMB 70,000 (US$11,200), and keeping it there will cost you another RMB 405,000 (US$65,000) per week. The third column is said to be the monthly fee. Negotiations take place over the QQ messaging service. While Apple has taken steps to counter the manipulation of App Store rankings, it’s quite difficult to identify manual downloads as being fake. Although the photograph is obviously a fairly recent one (as indicated by presence of the iPhone 5C), its source and nature are as yet unverified.